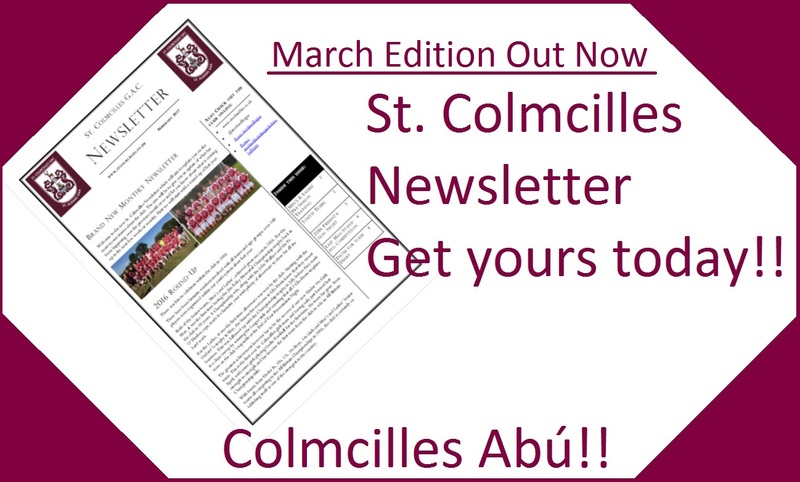 The Newsletter will be published every month or so and is aimed at bringing you the most up to date information from the club with news on fixtures, results, match reports, club events and more. The new issue contains details of our new O’Neills Club Shop, more information about the start of training for all teams, some photos from our Youth Teams from last year and dates of some of our scheduled events for 2017. It is out this weekend and will be available from club committee members, players and the St Albans Irish Club. The first issue contains a round-up of the 2016 season, information about the start of training for all teams, some photos from our Presentation Night and dates of some of our scheduled events for 2017. It is out this weekend and will be available from club committee members, players and the St Albans Irish Club. 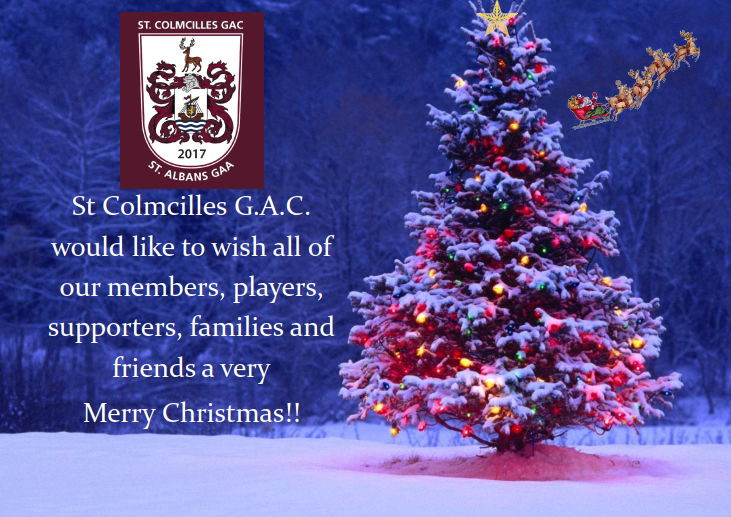 St Colmcilles GAC is delighted to welcome you to our annual End of Year Presentation Night. What a successful year it has been so on Saturday 19th November join us to celebrate all that the club has achieved in 2016. There will be Annual Awards & Cup and Medal Presentations on the night. Also a raffle competition with fantastic prizes. Entertainment on the night will be The Mighty Quinn Band featuring our very own Sinead Quinn as lead singer. Sure to be a fantastic show!!! Here she is singing a good Christmas song with The Feeling a couple of years ago and further back with The Dawnbreakers. I’m sure there’ll be plenty more like this on the night! Tickets cost £25 and are available from all committee members. Yesterday was a fantastic day for the future of Gaelic Football in St. Albans and Hertfordshire. The Gaelic for Girls training program that is underway at St. Colmcilles got their first competitive outing in a tournament held in Cotlandswick that contained 2 teams from London and 2 teams from Claddagh Gaels in Luton. After 5 weeks of training and learning the game of Gaelic Football, the new St. Colmcilles U14s Girls team were delighted to get out onto the pitch to try out their newly acquired skills. They absolutely hit the ground running as they won all 3 of their matches. It was great to watch as all of the players, some of whom had never played, or even watched, football until recently, took to the game naturally and scored some brilliant goals and points. The girls will be out again in three weeks in another mini tournament before its off to the All Britain Championships in July. In the meantime, training continues Monday evenings from 7pm to 8pm at the St Albans Irish Club (AL2 1DW). A big well done to all the players and also to the manager Neil and coaches Ellen, Eilís and Laura who were awesome yesterday and a massive thank you to Active St Albans who support the Gaelic for Girls program at St. Colmcilles. This weekend saw the Under 10s take part in the London Tournament this weekend in Greenford. They won every match that they played, representing the club fantastically. More photos of the team in action can be found here. Just a few highlights of the Glo-Herts league match against Cambridge Parnells yesterday. A Special Message to St Colmcilles Ladies from Nathan Carter!! A special little treat from Nathan Carter to St. Colmcilles Ladies! 😍🏐🏆 He’s promised he’ll come to the final when we make it! 💪🏼😁 Colmcilles Abú!! And so, it starts. Its that time of year where we get back training and try to shed all that weight from the Winter break and get prepared for the 2016 season. Firstly for the men. Training starts this week on Tuesdays and Thursdays at 8pm for 4 weeks. It takes place on the astro-turf at the Cotlandswick Leisure Centre at 341 High Street, London Colney, AL2 1EB. All new players are welcome. If you are interested in joining the Men’s team please contact our manager Kevin on 07581290204 or contact us through our Facebook page here. For the women, it also starts this week on Mondays at 7pm for 4 weeks. It will start with indoor aerobics sessions in the hall at the St Albans Irish club at Cotlandswick, London Colney, AL2 1DW. More information on further sessions to come soon. All new players are welcome. If you are interested in joining the Ladies’ team please contact our manager Kevin on 07912317744 or contact us through our Facebook page here. Both teams will be looking to build on strong seasons from last year and push on to ensure that 2016 is a successful year for both clubs. Don’t bother crying about it, might as well get it over and done with now so we’re fit for the tough season ahead! !